The plan includes reducing more than 70% of schoolyard asphalt, replacing it with green space and a mixed-use recreation and educational space. Because of Longfellow’s successful urban agriculture program, the plan also incorporates a new greenhouse with a rainwater harvesting system. Additionally, the inclusion of native plantings allows for unique spaces on the schoolyard that can represent native Wisconsin ecosystems complete with student-created signage. Pending a more detailed survey, an underground cistern could also be implemented beneath the planned field and bioswale to further manage stormwater runoff. 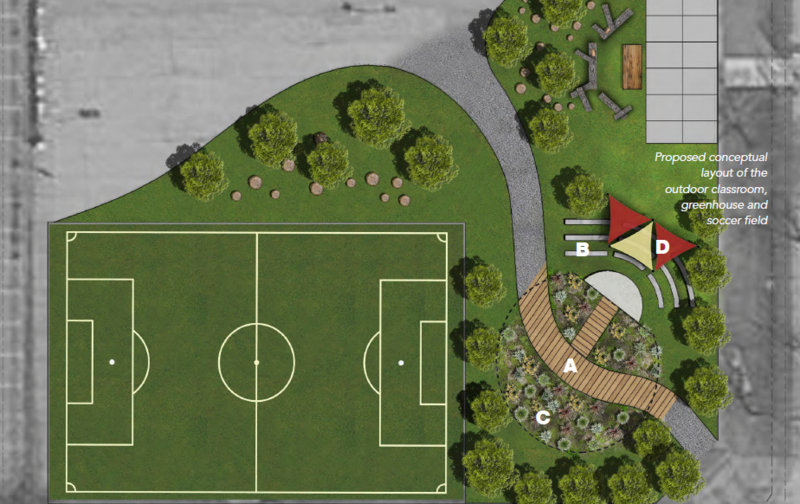 UW-Milwaukee's CDS proposes a partly covered outdoor classroom and area surrounding the bioswale proposed by Reflo near the schoolyard's primary entrance. A crushed gravel pathway will connect the entrance to the paved portion closer to the school. The pathway is interrupted with a boardwalk that traverses the bioswale, with an adjacent stage that hugs the edge of the bioswale. The stage looks out onto a berm created from soil dug up for the bioswale. Concrete retaining wall benches are shaded by sun sail shades attached to vertical posts. Natural stump seats near the soccer field and the green house provide seating and natural play equipment for younger students. Mouse-over, scroll, and zoom to explore this embedded Prezi document. Hover-over and use the right arrow to advance through the presentation slides. The redesigned schoolyard not only captures stormwater, but also creates new space for playing, performing, and planting. With shared ownership, Longfellow’s green team will continue to build on providing lifelong learning opportunities for our students and their families. We look forward to developing and nurturing our ecoliterate ambassadors, as they will be the key to redevelop and revitalize our neighborhood.